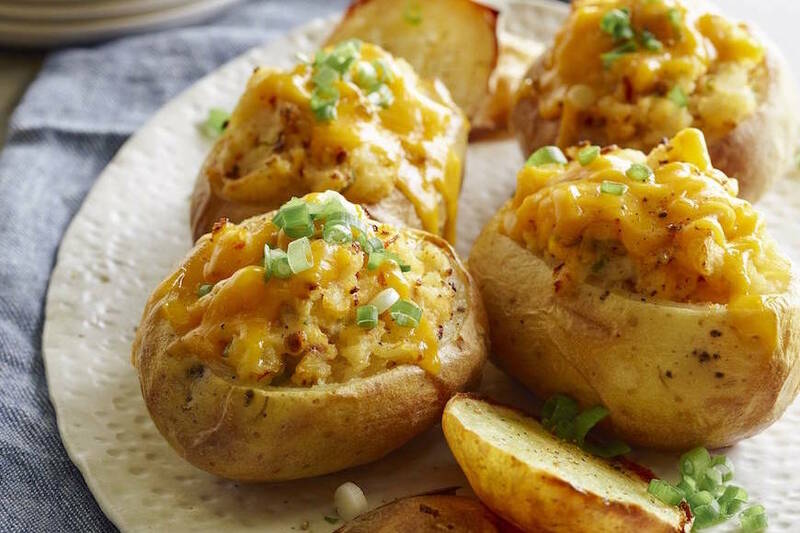 Extra delicious Chipotle Cheddar Twice Baked Potatoes! For an extra punch of flavor, I mixed in some crumbled bacon! Hold the potato with an oven-mitt or towel, trim off the top of the potatoes to make a canoe-like shape. Carefully scoop out most of the potato into a bowl. Take care to leave enough potato in the skin so the shells stay together. Mash the potato lightly with fork along with 2 tablespoons of the butter and sour cream. Stir in the scallion, chipotle pepper, and season with salt and pepper, to taste. Season the skins with salt and pepper. Refill the shells with the potato mixture mounding it slightly. Brush the reserved top with the remaining butter and season with salt and pepper. Set the potatoes and lids on a baking sheet, and bake until heated through, about 20 minutes. Sprinkle the cheese on top of the potato filling and bake for 2-3 minutes more until cheese is melted. Serve immediately. Extra scallions to garnish if needed.